I frequently talk about my community back home in Utah and how amazing the women I've surrounded myself with are. Moving away from home was challenging for many reasons but one of the main reasons was it was difficult for me to find my people - specifically finding women that enjoy the same things as I do. Making new friends as an adult can be challenging but opening yourself up to new people can be an incredible and rewarding experience. 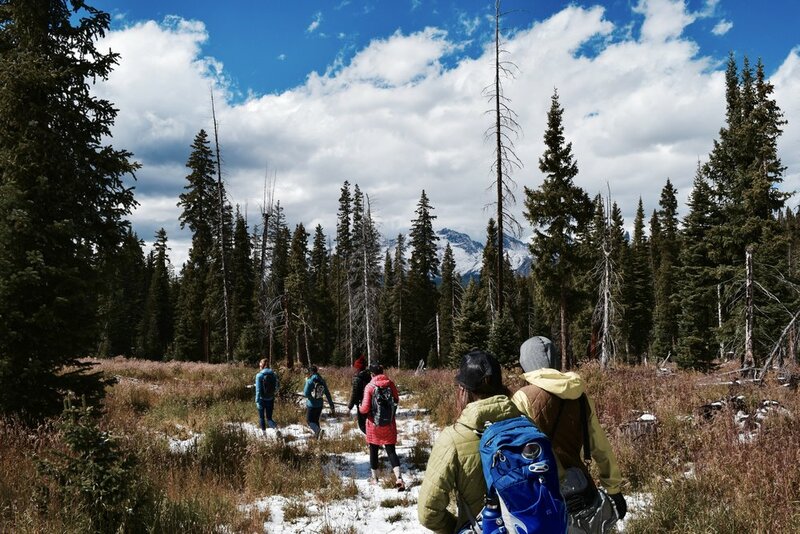 A few weeks ago I was invited to the San Juan mountains with 17 other women for a weekend with Wild Women's Project, now called Project16x. 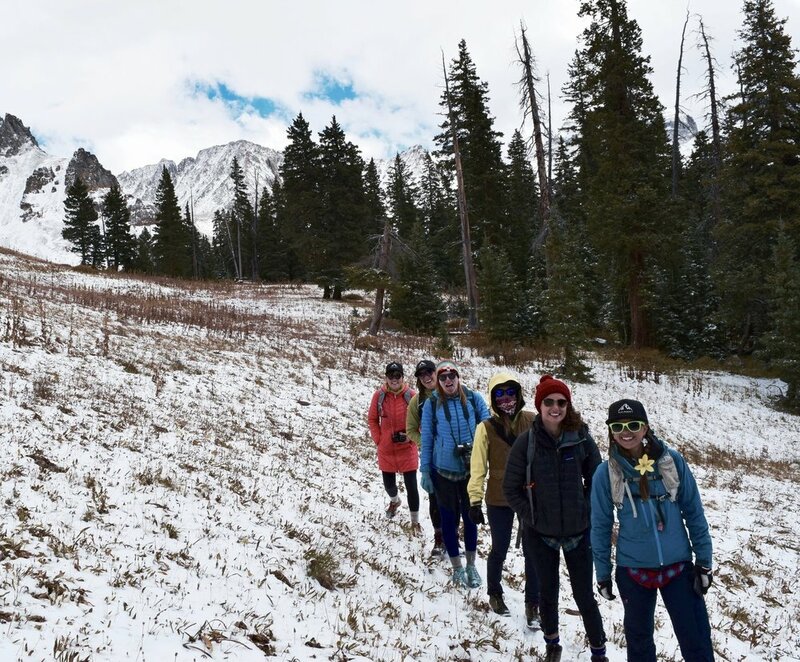 I had no idea what to expect and to be honest I was a little bit nervous heading into the backcountry with a bunch of women I'd never met before. I went in only knowing one woman personally, but left with 17 new friends. Project16x was established by Amanda Goad, founder of Bold Brew, a marketing firm based out of Durango, CO. In starting Project16x Amanda had a clear goal: create an intimate environment for women in the outdoors to network, collaborate, inspire, and talk about issues important to each of us. The weekend gathered women that might not have otherwise met, including writers, athletes, photographers, and influencers, to cultivate new relationship and help develop more female leaders. We traveled from several different states and met at trailhead on Lizard Head Pass just outside of Telluride, CO. A mellow 2.5 mile forrest hike lead us to the very picturesque High Camp Hut, situated at 11,000 feet. The rustic hut sat above a peaceful golden field with an epic mountain backdrop. 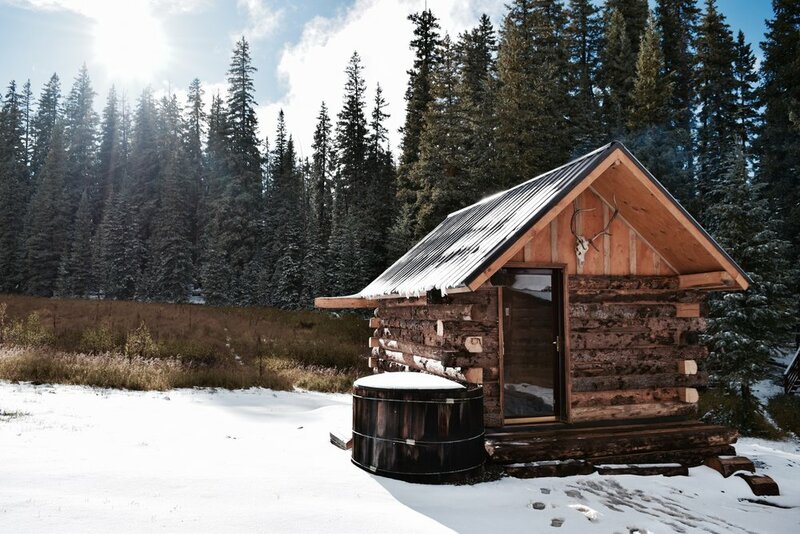 It had all of the amenities a girl could ask for, including a wood burning sauna and hot tub. Our first evening we settled in, breaking the ice and getting to know each other and what brought each of us to Project16x. The fire heated up the cabin as we cuddled up on the couches for introductions. We all came from different backgrounds and cultures. Some of us had grown up in the outdoors camping with our parents as kids. While other women had discovered the outdoors later in life. Either way, we were all deeply passionate about the outdoors. Each of us had been affected by nature and the outdoors in ways that had changed us. There's no doubt that women feel more social pressure than men and the outdoors is a place for us to escape, heal, and be reminded of our personal power. When women head into nature together we thrive and re-energize each other. There was no denying the positive energy in that little mountain hut, it was seeping out of the windows and into the fresh mountain air. The weekend was filled with deep conversations that sometimes tugged at our emotions and had some of us in tears. Many of us related with one another on struggles that we had overcome in life. We were all there to listen, share, and support one another as we each navigate this crazy world as women. I had emotions and opened up on a personal level that I didn't anticipate that weekend but I was surrounded by a circle of nourishment. Surrounding ourselves with other strong, encouraging, and loving women helps us to learn how to provide better emotional and mental support for other women. As women we are naturals at forming nourishing environments for each other, we just don't always do it out of fear of being judged. The retreat was also an opportunity for each of us to learn from one another and to talk shop about our work and what inspires us. We tackled the lack of diversity in the outdoors and the subject of "leveling the playing field" for women in an industry so dominated by men. Collaborations were also frequently discussed. We all wanted to find ways to work together to achieve new goals and create new objectives as female leaders. The voice of women is strong and inspiring and the women at the retreat all had something to say. We all move a little differently, living and working in the outdoor industry, but we moved as one that weekend feeding off of each other's energy. I left that weekend on a high from all the feminine energy I had been surrounded by and I'm sure I'm not the only one that went home feeling loads of inspiration. The experience was unique and magical and turned out to be much more than expected. It was a needed break in the backcountry that forced me out of my comfort zone in such a positive way. Amanda has created something real special with Wild Women's Project and I am forever grateful for the opportunity to be involved. 18 industry leaders under one cabin roof was a gentle reminder of who really runs the world: women.